Tiana Webberley jumped into the Ninja scene in 2015, when she competed on season 7 of American Ninja Warrior. Since then, a world of opportunity has opened up for her. She has competed in every season since, AND she has become a stunt woman! Check out her (rather impressive!) American Ninja Warrior stats below. Tiana’s list of stunt gigs is getting pretty long too. She has already appeared in at least six films/tv shows. Tiana even had the opportunity to be a Black Widow stunt double in a Disney Summer of Heroes commercial. On top of this success, another opportunity has popped up for Tiana – international travel! Up until a couple weeks ago, Tiana had never left the country. That changed last week when she took a 15 hour flight to Hong Kong to participate in an event called Hong Kong Sevens, a giant rugby event surrounded by a festival atmosphere that included face painting, street performers, food, music, and ninja! The ninja course was set up just outside the Rugby stadium, with Tiana and U.S. Olympian, Jonathan Horton, doing demos and coaching festival-goers through the course. Tiana explained that while a few dedicated Ninja fans recognized her from watching American Ninja Warrior clips on YouTube, the sport of Ninja was new to many of the local people. They LOVED it, and they went crazy every time Tiana landed a lache. Many of the locals were quite shocked that a women was performing these skills! 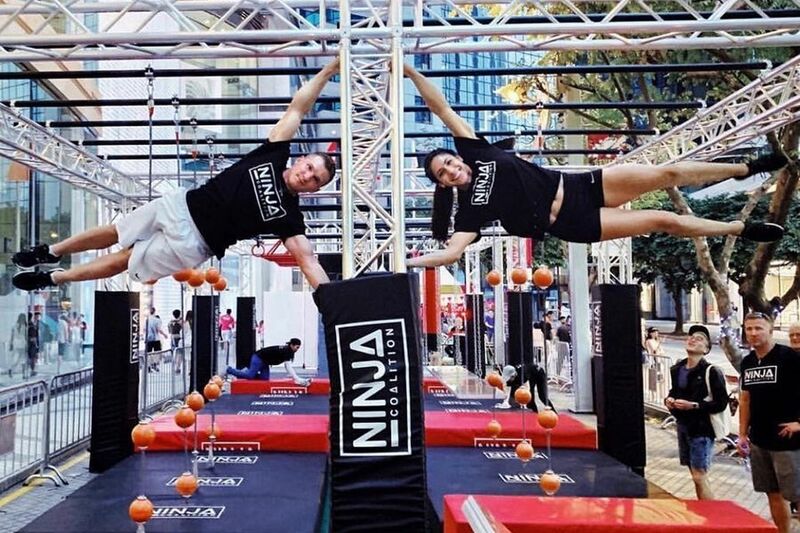 One of Tiana’s favorite memories from Hong Kong is a girl who came back to the Ninja course on three separate occasions because she was determined to make it through the whole course. The third time was a charm! Tiana also reminisced about the language barriers that turned navigating the city into a fun adventure and put an interesting spin on coaching participants through the course – relying on mostly gestures and movements. Tiana will continue her international travels next month when she travels to Barbados for a National Ninja League competition. The @barbadosninjathrowdown is coming back May 11th! This will be an NNL qualifier, and an awesome time! If you are thinking of going, make sure to check out @rostrevorhotel !